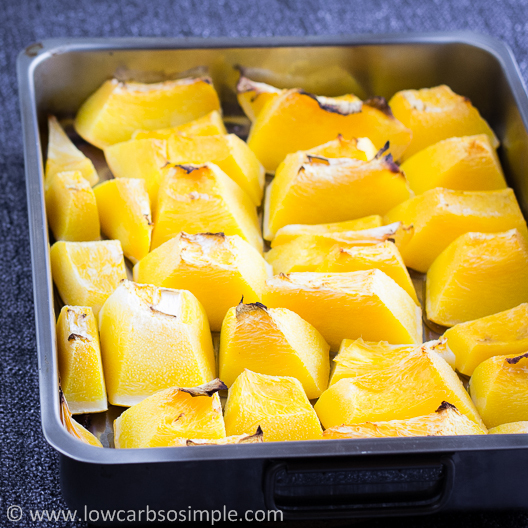 My Way to Roast Pumpkin - Low-Carb, So Simple! -- gluten-free, sugar-free recipes with 5 ingredients or less | Low-Carb, So Simple! 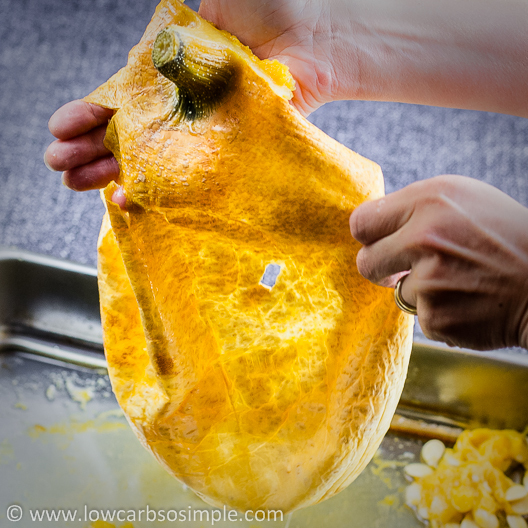 When I roasted pumpkin for the first times I used this method from Elana Amsterdam. I hope you are familiar with her brilliant blog. The method worked otherwise well, but I don’t know what I did wrong since each and every time my roasted pumpkin turned out too watery. 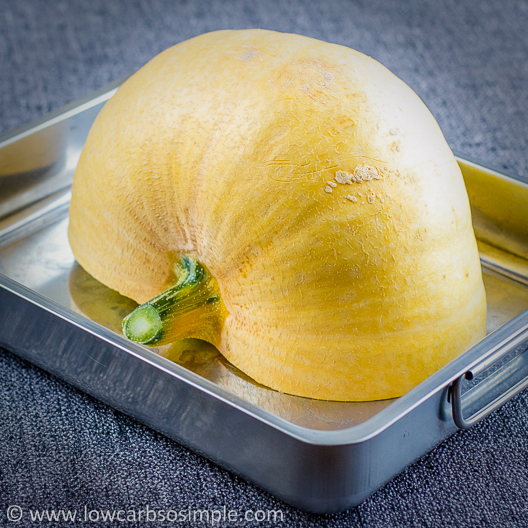 I wanted to have as thick pumpkin as the solid-pack pumpkin they sell in a can. I thought I must develop my own way to get the consistency I want. Last year I made several more or less successful experiments, but unfortunately I didn’t jot them down. Shame on me. Keeping my eye on the fact that I wanted to do plenty of experiments with roasting the pumpkin and develop many pumpkin recipes, I have grown pumpkins worth at least 175 lbs (approximately 80 kg) this year. A rough estimate. So, it seems that we are going to eat only pumpkin during the winter… Pumpkin muffins, pumpkin pie, pumpkin custard, cream of pumpkin soup, pumpkin spice latte… Actually, I could imagine much worse things. I vaguely remember that last year I got the best results when after removing the seeds I cut the pumpkin into approximately 3 × 3 inch (7.5 × 7.5 cm) cubes and roasted those at a relatively mild temperature for quite a long time. Like this. The problem were the burned tops. Roasting at a milder temperature reduced burning, but the tops got easily dry. This year I tried the same method. 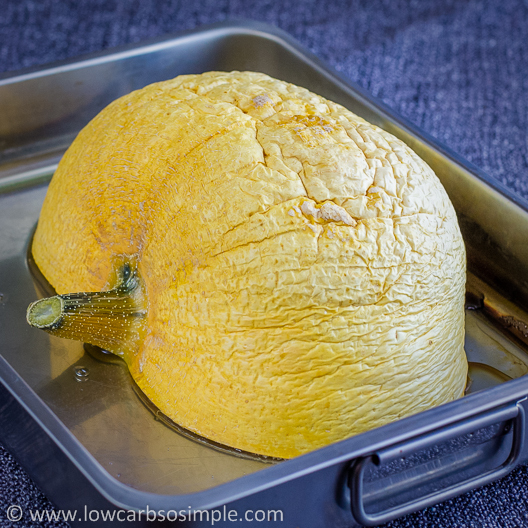 I cut one half of 18 lbs (8.2 kg) weighing pumpkin into cubes and roasted the cubes in 350 °F (175 °C) oven for 1.5 hours. Quite okay, but there was some fluid separating. Next I cubed the other half and roasted the pieces for 2 hours in milder, 300 °F (150 °C) oven. Better, but still a bit too much fluid. The next batch I tried to roast a half an hour longer. Again better, but not perfect. All in all, I prefer milder temperature and longer roasting time to get rid of the excess fluid and to guarantee soft and tender flesh which is not burned. I thought it wasn’t anyway a good idea to cube the pumpkin. Moreover, it was quite laborious to cut those cubes. I thought pumpkin halves might work better after all. I roasted one half of a big pumpkin so that the cut surface was facing up. During roasting there was a puddle in the center and it looked kind of funny. I was wondering how to get rid of the fluid. I decided to let the roasted pumpkin cool down completely and then remove the fluid, but after cooling down the fluid had almost totally disappeared! The fluid had somehow soaked into the flesh. As you can guess, the result was watery. 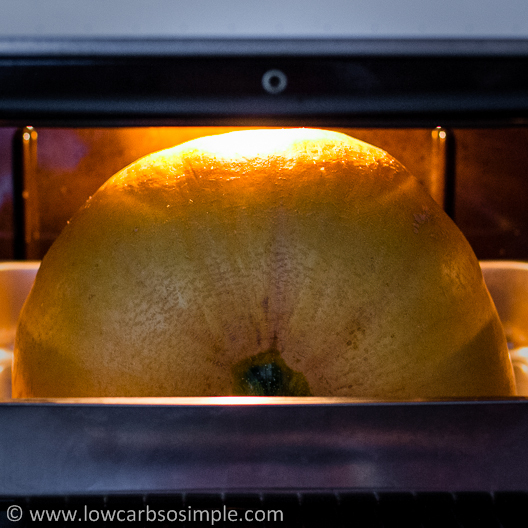 Maybe it was better to roast the pumpkin so that the cut surface would be facing down? The pumpkin didn’t produce any fluid while roasting, but during cooling down and scooping out the seeds it was flooding. I got somewhat desperate and was wondering for the umpteenth time how to get rid of the excess fluid. I was also thinking of roasting a whole pumpkin but since I have heard of horror stories about pumpkins exploding in the oven no matter how much you have poked or pricked them with a knife. I thought a half of a pumpkin is the largest piece I dare to roast. I still tried once my method from last year and cubed the pumpkin. After roasting I got really much fluid, so I mean REALLY much. I was desperate. How on earth I could get thick roasted pumpkin instead of that colorless, watery and tasteless stuff? Eureka! It suddenly hit me that I simply could strain the roasted pumpkin. I could roast a half of a pumpkin, remove the seeds and strain the flesh. Worked like a charm! So, let’s take a closer look of the method I currently use. First I take a nice, big pumpkin, rinse it and pat dry with a towel. The pumpkin below is whatever giant variety, unfortunately I don’t remember exactly which one. I ordered plenty of pumpkin seeds but the small varieties didn’t make it. Well, that’s nothing new since I’m a lousy gardener… To be honest I’m extremely surprised that I could grow that many pumpkins myself. So, let’s take that cleaned pumpkin. This beauty weighs 17 lbs (7.8 kg). I take the biggest knife I own (which is after all not that big-sized compared to the pumpkin…), sharpen it and halve the pumpkin. Here are the halves. Actually, at this point you could scoop out the seeds, but I’ve decided to do that after roasting. Somehow I feel that less precious pumpkin is lost then. I take one half and place it face down on the largest roasting pan I have. This pan I have bought from Ikea. By the way, I don’t use the grill rack here. I put the whole thing in the preheated 300 °F (150 °C) oven. I let the pumpkin roast for 2.5 hours. Actually, I think 2 hours would be enough, but I just want to ensure that the flesh is soft and tender. Some say you can overdo the pumpkin but I didn’t have that problem. So far. … and let it cool down for a few hours until it reaches room temperature. It gets a bit wrinkled. … or if I want to do it in a quick and dirty way, I simply grab the seeds out by hand. Clean hand. If I’m in a hurry, I just scoop out the flesh and place it in a large bowl. Then I simply pour away the excess fluid. 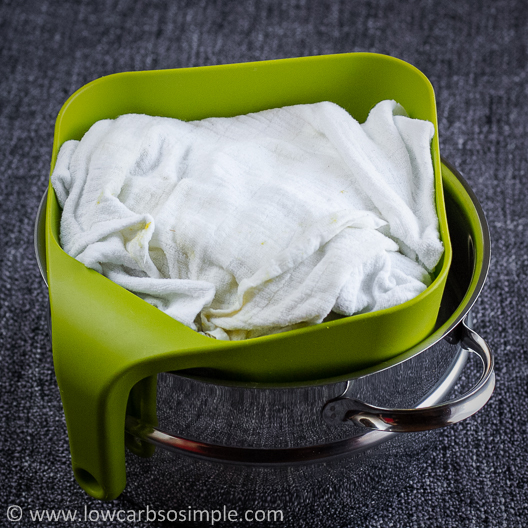 … cover with the excess cheesecloth and let the fluid drop nicely to the saucepan. … and purée the pumpkin with immersion blender. Well, this is not really an absolutely necessary step, but to ensure the smooth texture, I often purée the pumpkin. For me it’s important to have smooth-textured pumpkin especially when I make soup, pumpkin spice latte or other drinks from pumpkin. Actually, if you have a really good blender you don’t have to scoop out the flesh after roasting, you can save time and trouble — at the same time getting more fibers and nutrients — by placing the flesh and the skin in the blender and blend everything until smooth. The color will be more vibrant and the consistency thicker. You just have to get rid of that possible excess fluid somehow… Well, straining is good for that, too. My main point is to strain the pumpkin flesh after roasting. 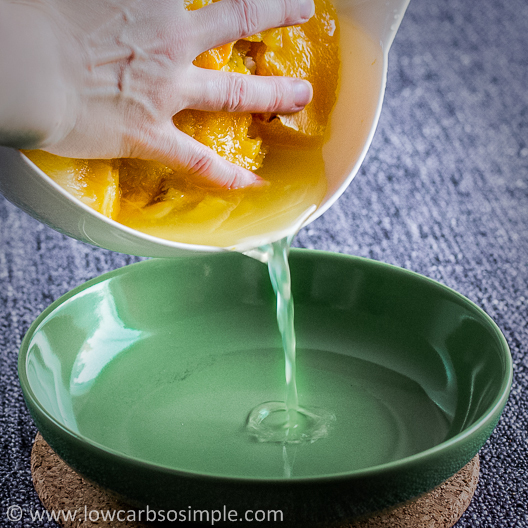 Either I do it in a strainer covered with cheesecloth, or then I simply place the flesh in a large bowl which I put in the fridge, keep it there overnight and on the next day I simply pour away the fluid which has separated from the flesh. It’s as simple as that. I can easily regulate the thickness of the pumpkin with the straining time. The longer the straining, the thicker the consistency. This is the roasting method I’ve used this year. Could be that next year I’m going to develop even better method, who knows. 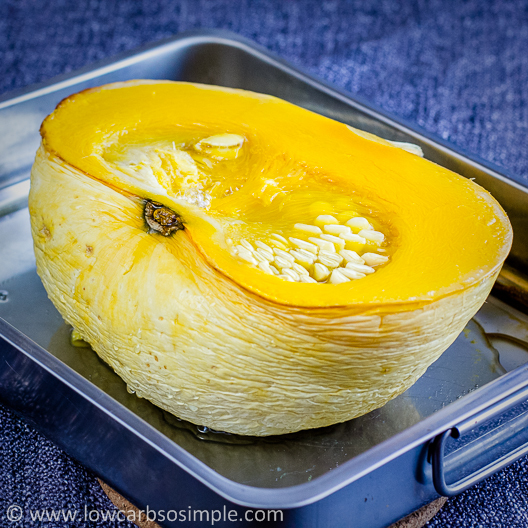 I would be delighted to hear from your method how to get perfectly roasted, thick pumpkin what you can use for soups, pies, custards, you name it. All thoughts and ideas are welcome! thankfully the pumpkins grown in australia are firm bodies and roast well. 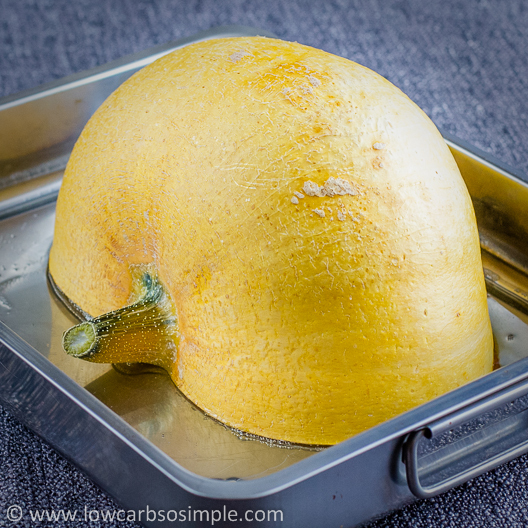 Even the butternut is firm and called a pumpkin rather than the soft flesh squash butternut available in the Uk. In two days it will be Thanksgiving here in Canada. I have 4 sugar pie pumpkins to roast and make pie with! Thanks for sharing your method of straining the flesh. 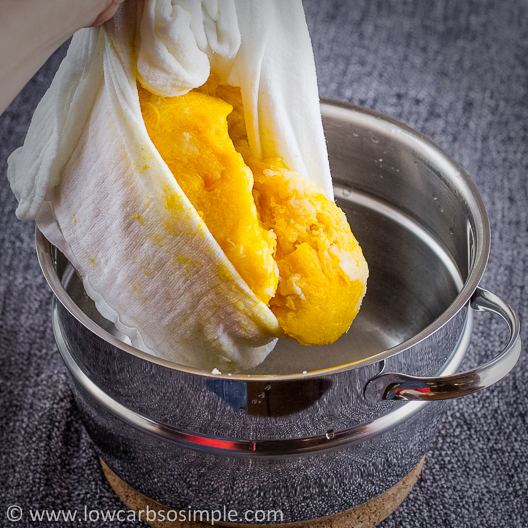 That’s what I do too (cheese cloth method) and it makes lovely puree to use for pies, cookies, lattes, muffins, etc. Just found your site because of your crustless pumpkin pie, which is what I’m going to make for my family. Hopefully they won’t be too disappointed with my low carb meal. 🙂 Going now to have a nose about your site. Looks lovely so far! Hi Cathy and thanks for your comment! Great to hear that you found the method useful. Hope you and your family like also my recipes! I just made this…. but it made a lot more pumpkin than I can use right now! Have you ever frozen it? Or do you always use it at once? Hi Doug, yes, I always freeze the leftovers in freezer storage containers (1-2 pint), usually there is plenty of pumpkin! Hi Dorothy, great, please tell me how you succeeded! I haven’t heard of pumpkin jam but I wouldn’t wonder if somebody has sometimes made it. Thanks for tacklinsg the pumpkin and figuring out the best method to get rid of water. I use pumpkin for so many things, including a savory a potato substitute. But my favorite is what I like to call a “pudding” with brown sugar substitue, butter, cinnamon and a little cream – bake until slightly crusty on top. 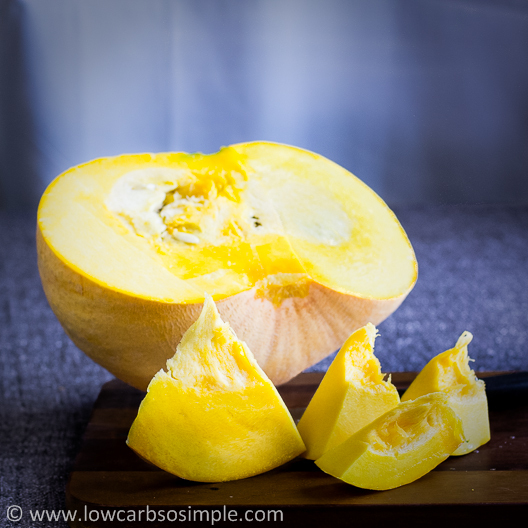 Your blog is inspiring me to stay true to the low carb lifestyle. Thank you! Hi Susan! You’re welcome 🙂 Great to hear you like my blog. Hope you find my roasting method useful if you try it out. Btw, that “pudding” sounds absolutely delicious!